The foot is an amazing machine – just watch someone dance, jump or run. Yet despite over 100 years of research, our understanding of foot function is still limited and our knowledge of how our ancestors walked is even more rudimentary. What role did locomotion play in our evolution? Did foot function help determine which human species became extinct? 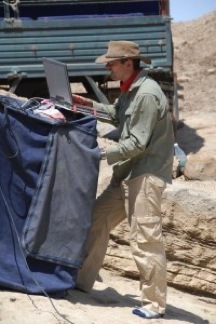 Professor Matthew Bennett has spent the last ten years studying fossilised human footprints, and in 2009 he was part of a team which discovered the second oldest footprint site in the world in Kenya. In this practical lecture, he told the story of his research and answers the fundamental question: did our ancestors walk in the same way that we do? Attendee, Nicola reflected that: “Professor Matthew Bennett gave attendees at this event a very interesting insight into his extensive work investigating fossilised human footprints around the world. We learned where the world’s most famous footprints are located, from Kenya to Namibia to Italy and Mexico. We learned how Professor Bennett and his colleagues actually ‘read’ these footprints, and he gave us an overview of some of the science involved in analysing them. We also learned that geology matters!